Why have we never eaten stuffed peppers before? I've seen all sorts of versions out there, both on the web and in magazines, but have for whatever reason never gone ahead and made them. This particular recipe is one I pulled out of Real Simple, but instead of stuffing them with beef, I kept the same flavor profile but we used lentils instead, making them healthier but still hearty! Ryan actually put this recipe together--the only thing I did was add the finishing touches: salsa, sour cream, and green onions! He once again receives a gold star for taking care of dinner while I continue to knock out my LAST paper of my LAST class EVER. Our peppers had a bit more heat than Real Simple's, thanks to the addition of some chili powder and half of a jalapeño. Feel free to spice yours according to your preference! 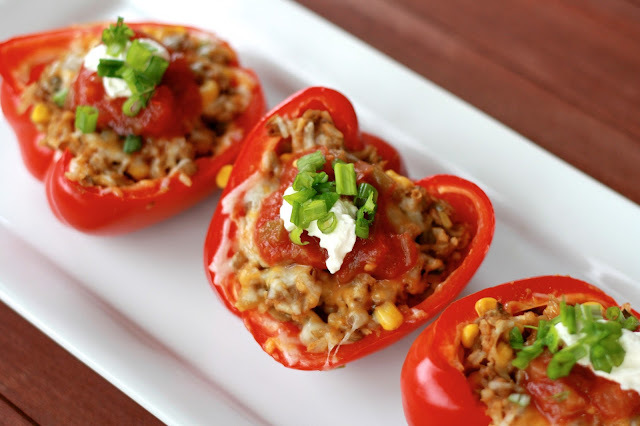 These would also be good with black or kidney beans, ground turkey, or quinoa. Play around with your favorite Mexican-inspired ingredients! Just make these, and soon! 1. Preheat oven to 375F. Cook the rice and the lentils separately, each according to package instructions. 2. Head the oil in a large skillet over medium-high heat. Add the scallion whites, corn, chilies, jalapeño, cooked rice, cooked lentils, cumin, and chile powder. Stir in 1/2 cup of cheese with 1/2 tsp salt and 1/4 tsp black pepper. 3. 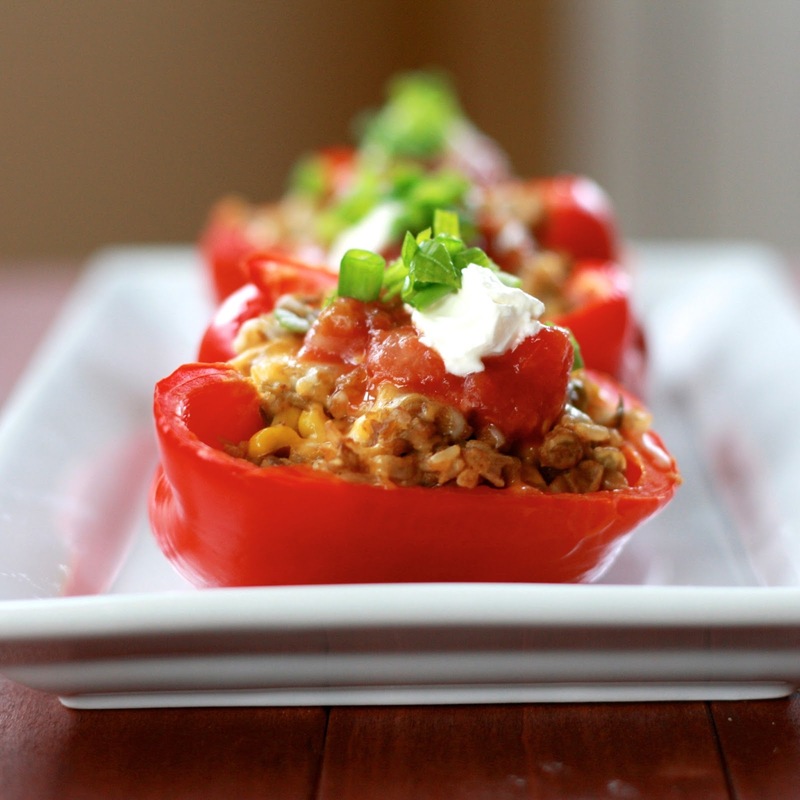 Arrange the bell peppers, cut side up, in a 9 x 13 inch baking pan. 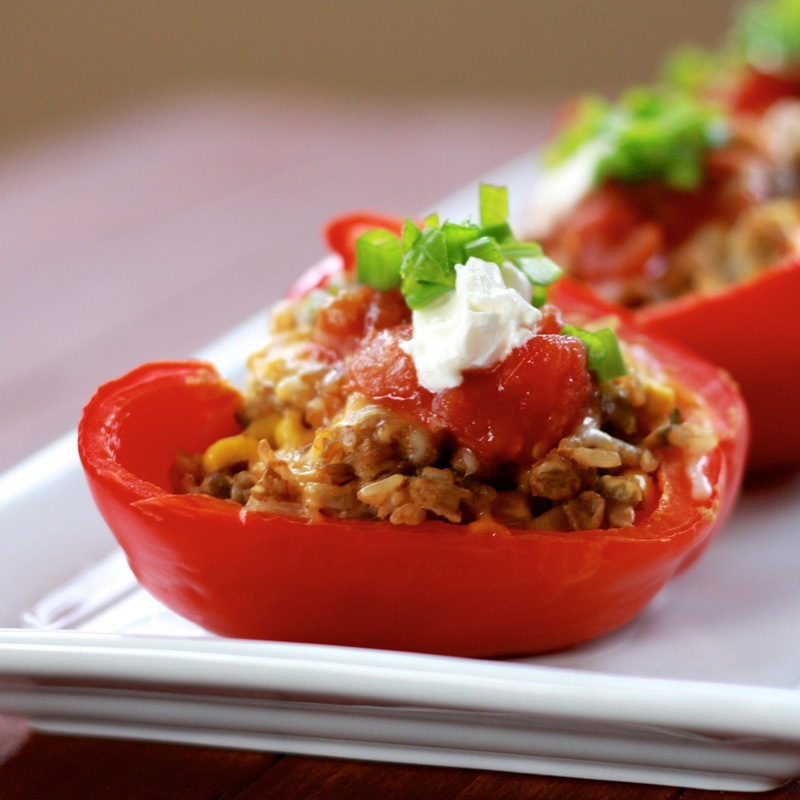 Divide the lentil and rice mixture among the bell peppers. Add 1/2 cup of water to the dish and cover with foil. Bake for 30-40 minutes, until peppers are soft. 4. Remove foil, sprinkle with remaining 1/2 cup of cheese, and bake for an additional 5-7 minutes. Serve topped with sour cream, salsa, and scallion greens.